Many people go to their local home improvement stores to buy a toilet – only to be shocked at how oddly complicated the process seems. Buying a toilet sounds like a simple task, but there are so many different models available that you can easily get overwhelmed looking for the right one. The first step in buying a toilet is in knowing what size toilet is needed. There are many different physical sizes available to choose from, and in order to purchase the right one, you need to know how much space you have available in your bathroom. Measure your current toilet and try to find one that matches up closely. Next, you’ll have to decide what model to buy. This is where you’ll have to do your research. 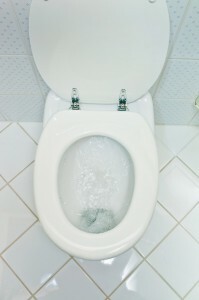 In order to find the best water saving toilet, look for reviews online or in consumer publications. You can also ask your local plumbing company what they recommend, and be sure to quiz the employees at your local improvement store as well. How Do I know I’m Getting Enough Flush? Toilets are ranked using “flush ratings.” These ratings let you know how reliable the toilet is, as well as likely it is to become clogged. Toilets are also listed by how water efficient they are, so be sure to look for one that labeled “water saving” or “high efficiency.” Otherwise you may end up with one that is not so good for the environment – or your water bill. After you’ve narrowed down the toilet models to one that you like, the next thing that you’ll need to do is choose one and either install it yourself or call your local plumbing company and have someone come out and install it for you. While the installation instructions may make the job sound easy, any time that you are working with water, pipes and heavy objects (like toilets) it’s always a good idea to call in the professionals.